Three is a powerful number when it comes to visual compositions such as a photograph. I’m not talking about the classic rule of thirds, but the less mainstream “Rule of Three” — a powerful composition guideline that can add a tremendous amount of visual impact to your photos. I was inspired to write this post by Daniel Scocco at the Daily Blog Tips, in his most recent group writing project titled “Blog Project: Three“. He has asked his readers to write a post about the number three, on any topic whatsoever. Take a look at the photo above. How many birds do you see? 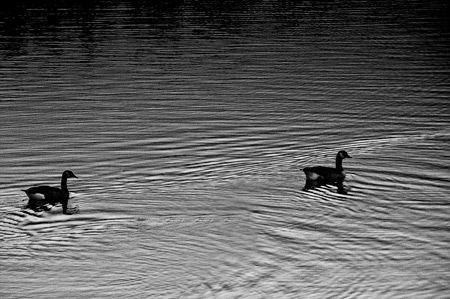 This photo is a fairly obvious example of the rule of three — there are three geese in the shot. OK, so maybe it’s not the most impressive photo you’ve ever seen, but it would certainly have less impact if there were two or four geese rather than three. Take a look at the shot below — and try to ignore my poor clone job. It’s just not as good, right? That’s the power of three. It’s more visually appealing to have three of something rather than two or four. It doesn’t even have to be the main subject that utilizes this rule, it can be applied to secondary subjects or background materials. Here’s another example. So you see, three of something can add some extra impact to your photos. The rule of three can even be applied in very subtle ways, such as three lines, three curves, three sections of the composition, three strong colors, etc. Next time you’re out shooting, think about how you can incorporate the number three into your composition — it might just add that little extra something to make it a keeper. How else could/do you apply the rule of three to your photography? This entry was posted in Composition, Features, Projects on July 6, 2007 by Brian Auer. I like to apply the rule of three by using three converging lines sometimes. Photos of roads are perfect for this, you’ve got the edges of the road and the yellow line down the center. Exactly road is having 3 lines. Lets tak Sunset above the road in desert. The example with the 3 geese sure does look better than the one with just the two geese. I would not have believed how much difference this makes. 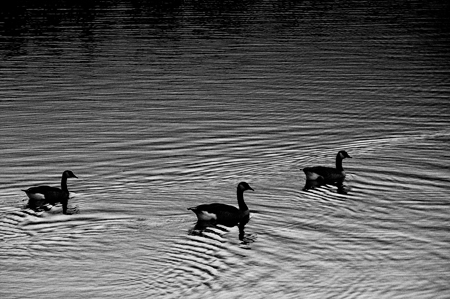 I have actually been photographing geese too – I have a pond near my house that is full of them. So far I have just gotten huge numbers of them in one photo. I should try some photos with just 3.